GAITHERSBURG, Md. 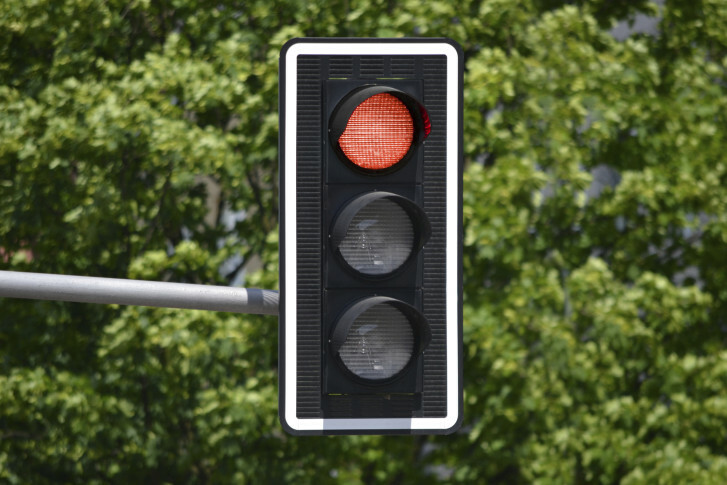 – Red-light cameras are common in Maryland, Virginia and D.C., but many drivers complained to WTOP Ticketbuster about a specific kind of ticket in 2013. These tickets occur when drivers make a right turn on red, but engage in a specific type of turn that is considered illegal. Known as a rolling right turn or sometimes referred to as a “Rhode Island roll” or “California stop,” these drivers are not coming to a complete stop before making a right turn at a red light. WTOP Ticketbuster has several videos that demonstrate this kind of rolling stop. In June, a driver in Rockville sent WTOP an email about a red light camera ticket at Seven Locks Road and Fortune Terrace. As WTOP reported in early 2013, the City of Rockville strictly interprets Maryland law on the issue. But according to the video, the driver never came to a complete stop. Another driver told WTOP Ticketbuster about a ticket he received on Washington Boulevard at Lee Highway in Arlington. The video also shows she did not stop before making the right turn. Finally, WTOP Ticketbuster we received an email from a driver who received a red light camera ticket at 12th Street and Constitution Avenue NW in February 2013. “If you look clearly at the picture, you will notice two things,” this reader says. “First, I stopped at the red light behind the line before making a right turn. Second, there is not a ‘no turn on red’ sign anywhere. They are asking me now to pay $300 for the red light infraction because they claim I never responded. Please help!” But the driver stopped after the crosswalk with half his vehicle in the intersection, then made the right turn. strict letter of the law. Several motorist groups and camera opponents are skeptical of these types of tickets, arguing that the rolling right turn on red does not pose a significant traffic safety impact. Out of 6.3 million crashes nationwide in 1998, less than 0.04 percent of them involved a driver making a right turn at a red light, according to a 2001 National Highway Traffic Safety Administration study. The report also found no fatalities occurred that year from an accident resulting from a right hand turn on red when the driver yielded to oncoming traffic. A NHTSA study in 1995 also studied the issue and found similar results. “Approximately 84 fatal crashes occurred per year during the 1982-1992 time period involving a right-turning vehicle at an intersection where right turn on red (ROTR) is permitted,” the report says. “During this same time period, there were 485,104 fatalities. Less than 0.2 percent of all fatalities involved a right-turning vehicle maneuver at an intersection where ROTR is permitted. A Texas A&M Transportation Institute study in 2004 also concluded that accidents from these turns are exceedingly rare and do not pose a serious traffic safety risk. Groups like the National Motorist Association and Safer Streets LA argue that these rolling right turn tickets are not about safety, but money. He tells WTOP that tickets aren’t issued unless the driver was going above 13 mph into the turn, which he believes can be dangerous to other drivers and pedestrians nearby.